Matt Ledbetter (KRMG General Sales Manager), Dustin Parkhurst (Creative Director), and Luke Hively (Digital Sales Manager) each spoke to the Collinsville Chamber of Commerce Thursday about changes to all modes of advertising since the internet changed how we make buying decisions. They indicated there were approximately 60 radio stations in this general area at present, each with different formats and audiences. They gave example of effective ads of various lengths and styles. Radio is free ... ads are of various prices and as with most advertising venues you pay more for prime times and targeted audiences. 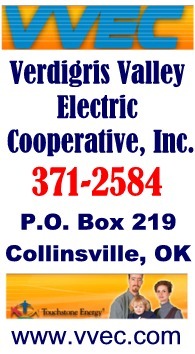 Chamber President Bill Johnston said this was the first of a series with TV advertising in May and then newspaper advertising to be discussed in June. 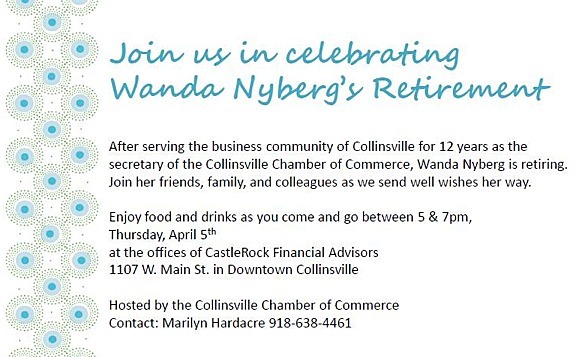 The Collinsville Chamber of Commerce is in the process of selecting a successor to Wanda Nyberg who has retired after serving the chamber as secretary for 12 years. Her husband Dale retired from his job the same week and they plan travel based on musical events of interest.